Beautiful log pan abode on whaler Bay..
Serendipity is located on beautiful Galiano Island...It is situated on Whaler Bay, and is nestled amongst the forest and wildlife...It is a well kept 50's pan-abode log cabin, on the water with a beautiful view...Deer, racoons, otters and eagles regularily frolick through-out the property. Quiet, serene, and comfortable, this little beauty sleeps two in the main cabin, but also has a guest cabin which sleeps two as well.....( this is an additional 50 pr. night, but can be negotiated for long term rentals). It is walking distance from the main ferry terminal as well as the local shops and the Madrona which is a world class spa. Because the water is collected from rain water and has been treated, there is bottled water provided for drinking. The tap water is used for dishes and showers. Please limit your showers to a min. in the summer as Galiano is one of the driest gulf islands and water must be brought in by truck to the its not a problem in the winter, because of the rain. There is no garbage pickup on the island so please take your garbage back with you. There is a compost to use for food scraps to help condense the waste. Serendipity is a wonderful quaint and peaceful cabin that I know, you will enjoy and feel relaxed by the time you check out. Pictures of birds and wildlife have been taken by Susan Robertshaw. Sue is an established nature photographer who has stayed at the cabin taking pictures and given me permission to use her photo's. I am a professional who specializes in grief and loss. I live in Vancouver but get over to Galiano to unplug as many times possible though-out the month. I am easy going, and enjoy meeting people and am pleased to be able to share this cabin so others can enjoy a little piece of heaven on earth. I believe, we all need a special place to unwind and reconnect to ourselves which is why I bought it many years ago. Its located close to the main ferry terminal ( Sturdies Bay) and is walking distance to the amenities ...... 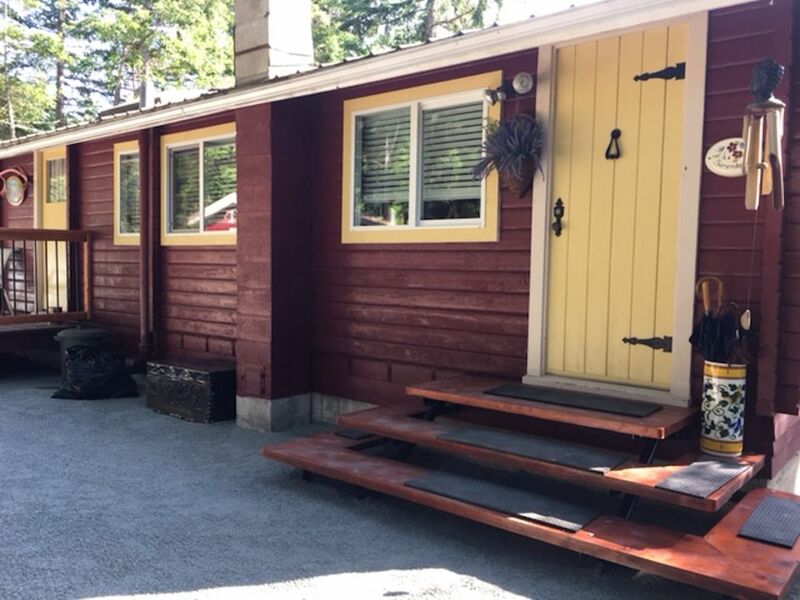 Situated in Whalers Bay, the cabin has a beautiful energy to it..
Sparkling, emerald green water and a beautiful deck too enjoy the wildlife and view makes the place unique and calm.......I love the serene and peaceful setting, amongst the trees and wildlife. Serendipity is so close to Cain beach, and a hop skip and jump from the shops and ferry terminal. It's an easy commute if you are travelling on foot. Toilet and shower and sink..
Galiano is a wonderful place to take in all of our west coast beauty. Amongst the many good eateries, we have one of the best 5 star restaurants on the island called Pilgrim. It has great reviews. Reservations are required. There is also a golf course for the avid golfer and for the hiker, many trails, and places to safely seek out solitude. There are no bears or cougars on the island, just alot of deer and racoons. It was a pleasure to have you both as guests, and I cannot thank you enough for leaving the place spotless! It is a magical place that has so much more than I could even describe, so I’m happy you and Ben were able to experience that in its entirety. Your welcomed back any time, and thanks again for choosing Serendipity. We truly enjoyed our stay at this very charming cabin. After full day of Galiano Island hikes it was very nice to get back to our cosy cabin. We especially loved the sunset views, eating all meals on the deck, the hummingbirds and the overall serenity of the place. There is a path that leads down to the water. During our canoe ride there was a curious seal that decided to swim along with us, that was extra special. We would love to come back! Thankyou so much Julia for the great review! It’s always so heartwarming to know that guests love it as much as I do. It hard to describe the ambiance of Serendipity and the beauty of the surrounding property, people just need to experience it for themselves I find. Anyhow Thankyou for being such gracious and respectful guests, and Thankyou for choosing my little piece of heaven as your getaway this summer. Hope to actually meet you one day! The cabin was a perfect place for our 20th anniversary celebration. It's just the right kind of cozy inside, where we slept so well, and the large deck outside was the perfect place to watch for wildlife, catch up on some reading, or just be for a bit. We enjoyed the proximity to some eats and shops that we could walk to. A swim in the bay in the late afternoon was about the best thing ever. We appreciated being checked-on by Deborra's friend who made sure we were comfortable. We would definitely stay here again.Thanks for a beautiful time. The property is very clean and tidy and the access to everything including the ferry, groceries, restaurants and coffee shops is but a few minutes walk away. I highly recommend this property for a quite getaway. Will most definitely stay again!